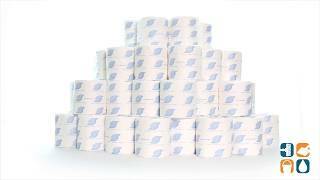 General Liners affordable toilet paper is the perfect balance of strength, absorbency and economy. This 2-ply toilet tissue is the ideal product for public restrooms, while still delivering the at-home quality that is missing in many high traffic bathrooms. Each roll is individually wrapped, ensuring sanitary protection and helping to keep storage clean and easy. Sturdy and durable, this premium, embossed toilet paper will fit all standard toilet paper dispensers. This pack of General Liners toilet paper comes with 96 rolls, perfect for anyone looking to save on wholesale toilet paper products. Unlike other inexpensive brand toilet tissue, this toilet paper is soft and gentle on the skin. Stock up today! Will recommend to all my friends! The product is great!! I started buying this product because the manufacturers of similar products available locally chose to supply less product (narrower rolls) for more money, a practice I find deplorable. What next, paper ribbon? I have bought GEN 500 for several years now, and the dimensions, and price, have remained stable. I commend you, and will remain a faithful customer. The product we received was better than advertised. I think the quality is good, but it has changed during these years. BUT, I would recommend it.